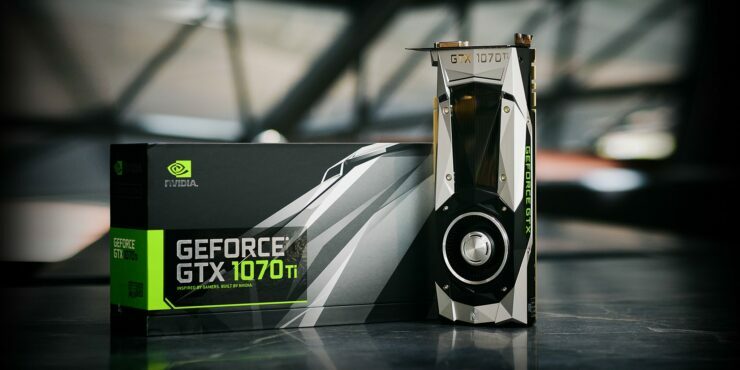 The GeForce GTX 1070 Ti is one of the products NVIDIA launched this quarter. 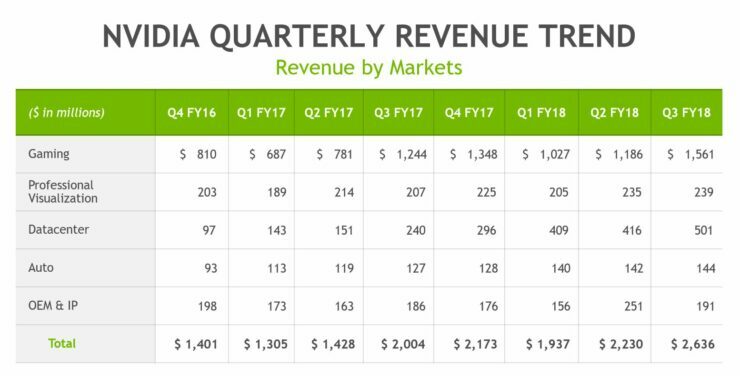 NVIDIA NASDAQ:NVDA yesterday reported record revenue for the third quarter ended October 29, 2017, of $2.64 billion, up 32 percent from $2.00 billion a year earlier, and up 18 percent from $2.23 billion in the previous quarter. It looks like nothing can stop NVIDIA’s bullish ascent into stardom (and elevated P/E levels). The company absolutely destroyed analyst expectations of 94 cents EPS and $2.36 Bil in revenue. So the eternal question rears its head again, is it finally out of steam or can we expect more in the quarters to come. Before we dig into the fundamentals, lets take a look at the financial summary. GAAP earnings per diluted share for the quarter were a record $1.33, up 60 percent from $0.83 a year ago and up 45 percent from $0.92 in the previous quarter. Non-GAAP earnings per diluted share were $1.33, also a record, up 41 percent from $0.94 a year earlier and up 32 percent from $1.01 in the previous quarter. “We had a great quarter across all of our growth drivers,” said Jensen Huang, founder and chief executive officer of NVIDIA. “Industries across the world are accelerating their adoption of AI. “Our Volta GPU has been embraced by every major internet and cloud service provider and computer maker. Our new TensorRT inference acceleration platform opens us to growth in hyperscale datacenters. GeForce and Nintendo Switch are tapped into the strongest growth dynamics of gaming. And our new DRIVE PX Pegasus for robotaxis has been adopted by companies around the world. We are well positioned for continued growth,” he said. This was an absolutely phenomenal quarter and the company managed to post growth in every single segment of the company. The hero of the result was none other than the Datacenter which is now the second largest segment in the company and well on its way to becoming a massive contributor to over all revenue. Its also worth noting that unlike the Gaming revenue which is prone to fluctuations and market sentiment the Datacenter segment is a much more reliable income stream and this is reflected in the market’s reaction (the price of NVDA stock jumped several dollars after the report was released). The company is clearly making serious headway on the Datacenter side of things and it clearly has an almost perfect grip of the gaming market. I feel that to trigger the next level of ascent, NVIDIA must post solid growth in the automotive sector. That is going to be one of the biggest battlegrounds for silicon design houses in the future and a solid grip early on will help immensely. The company did post a 13% increase in revenue – and in any other company of peers that would be great – but is not what we would expect from one of the sole providers of complete DNN + Visual Processing packages for autonomous cars on the market right now. This is something that NVIDIA might be able to achieve in the next quarter or two because of the fact that it has recently launched the Pegasus board which is several times more powerful than the last generation of NVIDIA self-driving tech on the market and gives the performance leap of several generations combined into one. Depending on how quickly the company can get design wins it could be the catalyst needed to trigger runaway growth in the Autonomous segment – something needed to justify the next level of P/E. There is also something else I need to talk about and that is that both AMD and Intel are positioning themselves against NVIDIA sending the danger that the company presents. This is both a bullish indicator and a bearish indicator simultaneously – because while it does show that the company has made enough progress to be taken seriously by the competition, the other two entities in the triopoly colluding together could make things difficult for green. Kaby Lake – G lineup represents Intel’s recent joint venture with AMD to make processors that have Intel CPUs and integrated Radeon GPUs. AMD also recently lost Raja Koduri to Intel and that means the company is getting ready to enter the discrete GPU market, which would be in direct competition with NVIDIA. With the positioning that we are seeing from both Intel and AMD, it is clear that NVIDIA will see increased competition in its major segments. The KBL-G lineup poses a serious threat for design wins in the mid-market segment which is one of the most populous ones. These are peoples who are do not want the laptops for purely gaming purposes but would still like some gaming ability. From what we have seen of the KBL-G chip so far, it beats low end NVIDIA counterparts like the MX150. The higher end counterparts consume a lot of power, and sharing the same package (in KBL-G) has the added benefit of increasing power efficiency. Similarly, Intel entering the discrete graphics market will pose a threat to NVIDIA’s dominance in the deep learning sector. It is the age of machine learning and nearly all machine learning happens on GPGPU based platforms like CuDNN. With Intel quickly gaining the capability to manufacture these coveted pieces of tech, it is clear that this represents a serious downside to NVIDIA. Their CEO did state that Intel wouldn’t be able to come up with anything brand new till at least 3 years, but we wouldn’t be too sure of that since a licensing deal with AMD could jump start Intel’s charge into edge computing and the DNN space. Verdict: Overall we are still bullish about NVIDIA as a stock but would urge investors to keep an eye on P/E levels, design wins for Pegasus board and/or disruption from Intel with the entry of a dGPU. Revenue is expected to be $2.65 billion, plus or minus two percent. GAAP and non-GAAP gross margins are expected to be 59.7 percent and 60.0 percent, respectively, plus or minus 50 basis points. GAAP and non-GAAP operating expenses are expected to be approximately $722 million and $600 million, respectively. GAAP and non-GAAP other income and expense are both expected to be nominal. GAAP and non-GAAP tax rates are both expected to be 17.5 percent, plus or minus one percent, excluding any discrete items. GAAP discrete items include excess tax benefits or deficiencies related to stock-based compensation, which we expect to generate variability on a quarter by quarter basis. Capital expenditures are expected to be approximately $75 million to $85 million, excluding the planned purchase of the property containing our new Santa Clara campus building.